We’re living in an age where our relationship with time is changing. We want everything done quickly. Our whole experience of life is speeding up. This is why practices like yoga and meditation are really important to keep us in check….to create the balance and keep us in touch with things that need time to master. In doing something slow because that’s the only way it can be done, a tremendous amount can be discovered. Our experience is deeper, richer and has more layers. By taking time we are open to possibilities. When we rush through our practice we miss the layers of our postures, our body, our being and our experience. In going through the layers, consciousness grows as you understand more deeply the more subtle things about your body, the nuances of your inner space and the synchronicity of body, mind and breath. There are tools you can use in class to be more present, particularly if you notice yourself moving too quickly or falling out because your mind is on something else. One is the heat. Stop and feel it, notice the sweat and try not to wipe it away, just let it be there even if it irritates you. Being aware of the heat helps you to focus. The second is the the breath, which grounds you into the body and the present moment. Third is the gaze. Fixing your gaze on one spot while you set up the posture and then as you breathe in it, grounds your mind and keeps it from wandering. Centring ourselves in the physical body means we are less caught in the stories of the mind and the drama it often creates. It keeps us calm, focused and more aware of ourselves. Creating greater awareness helps us to tune into our intuitive mind, our deeper self, our true self. We keep more energy within rather than giving it out. We balance out the niggling worries/anxieties/feelings of doubt and insecurity that circle around and inside us. It keeps us with the experience we are having right now. Our obsession with speed means we don’t have the time to process the things that happen to us. Life becomes a constant stream of stimulus and response with no gaps. The symptom of this is that we feel wired, overstimulated and exhausted, restless and unable to properly relax. That’s why we need yoga. It gives us the chance to process our experience. Especially really slow classes like Yin. The breath releases everything. The unprocessed emotion and the build up of tension. The breath is the neutralising force. It says yes you can. But we need to give ourselves space and slow down. In the words of Norman Blair… as we bring our attention more inward we become increasingly aware of our habitual patterns, our fixed points of view and embedded ways of being which may actually be outdated and no longer useful. Awareness opens the possibility of a fresh way of seeing, of increasing our flexibility of mind, creating new connections and inviting creativity. And as much as yoga is a practice its a process. A process of healing our nervous system, detoxing the body, balancing the endocrine system, calming the mind and cultivating focus. It gives you a place that you can come to where the end point isn’t the goal, its 100% about the process. The process is integrating mind, body and spirit and creating greater awareness of ourselves. We are building consciousness by cultivating stillness and coming back to our centre. The process takes as long as it takes…which is full of potential and endless possibility. If we move through yoga with outcomes in mind we end up judging ourselves for not being that now already and we miss all the possibilities. 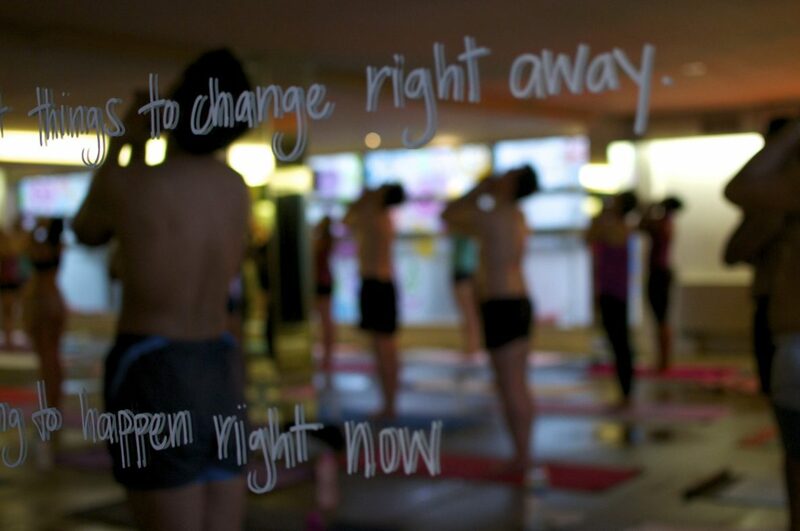 For just £35 for 20 days, new members can receive unlimited yoga sessions!